Ask anyone involved with management to name the 20 most important skills and competencies and you will encounter a wide range of responses. However, there will also be a broad agreement on what it takes to be a successful manager and The Secrets of Success in Management reveals all the key skills and core capabilities every manager needs to master from setting objectives and solving problems to negotiating and coaching. 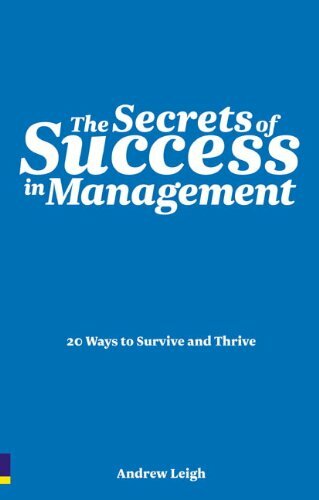 The book is divided into 20 bite-size chapters that provide proven techniques, hints, tips, ideas and know-how that you can use immediately to get you on the road to successful management. · Manage Yourself ...and much more. Do you want to be an ordinary or extraordinary manager? These are real secrets. Pearls of wisdom learnt through years of hard work leading and managing successful teams. They are what every established manager wishes they'd been told when they first started out. They will ensure you and your team not only look as good as possible, but you’ll be as good as possible. Very few become the manager they truly set out to be – now you can. Here are 20 crucial areas to master that will launch your career, your future, your success. Ready to fly? Andrew Leigh has worked as a senior manager for extended periods in both the public and the private sectors. He founded and built his own development company, maynard Leigh Associates, and he has also spent several years as a feature writer on The observer. 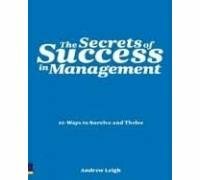 Andrew Leigh has had many books published in management and business skills categories around the world.